Some people are dare to be different. Some people love unique stuffs. Abstract Horse Piece is our innovation in crafting unusual shape for horse piece. It has brown color and made of high quality of teak. It's highly recommended for you collection. What happens when white meets red? We understand the chess game is a 'tough' game. 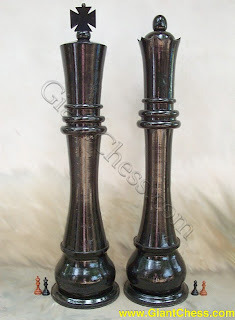 We try to lock the fresh look into our chess pieces and bring them for you. The white and violet chess pieces give you a new sensation in your game. If you think that it is floor mat with chess board pattern then the first impression fails you. It is our new product named fabric chess board. Made of hard fabric that is commonly used for collar, we print the chess board pattern and color them in dark and light brown. 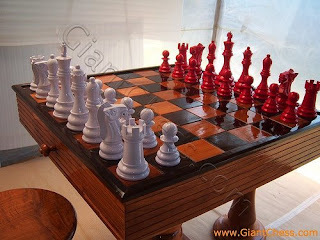 The fabric chess board is best used for giant chess and placed on floor. Besides, we never say that you cannot combine the comfortable feeling of sitting on this fabric chess board while playing your game. It is giant chess of 72" of height. We only use high quality teak to produce the strong and pretty giant chess. 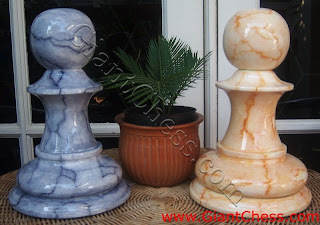 The 72" chess piece is commonly used for outdoor decoration as well as the indoor one. However, some people might find it FUN and CHALLENGING to play by using this giant pieces. It trains your muscle and strength. Who says that chess is only a game for brain? 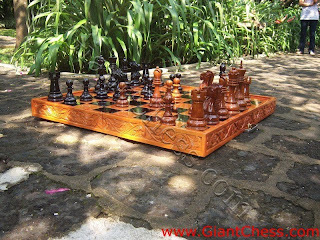 Label: Garden Chess Sets, giant chess of 72\"
Here goes the folding carve chess box from us. We take the idea from box and suitcase then apply it to the chess board. It has the handle so that it is easy to carry. 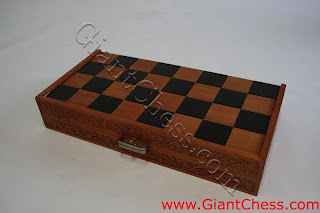 The box can be folded into two and it also functioned as the storage of chess pieces. Foam board is another alternative way to replace the regular chess board. You have to arrange every pieces of the foam board to form a whole chess board. It's FUN like a puzzle. The foam board is, of course, made from foam and easily carried. 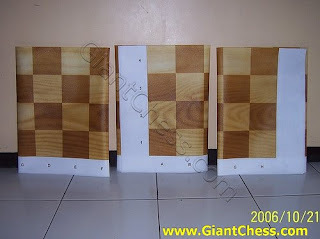 The foam board is suitable for the giant chess pieces. 'The step brother' of chess is Cheekers. It has the same board as chess board, but the pieces are different. Cheeker piece is round and thin. 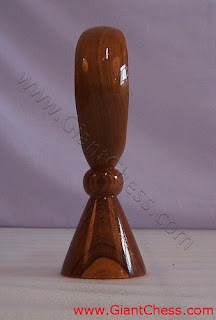 We craft the teak wood to produce the high quality of cheekers. It has two opposing colors, dark and light. 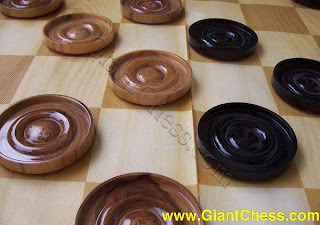 Wooden Cheekers is a good choice of board game for the family and friends gathering. Is it wood or marble? Combining the idea of luxurious marble and the elegance of wood, we craft this special chess piece. Our product is originally made from teak wood and painted in marble look. It has two colors, grey and yellow. This chess piece is moist in color and detail, strong, and artistic. 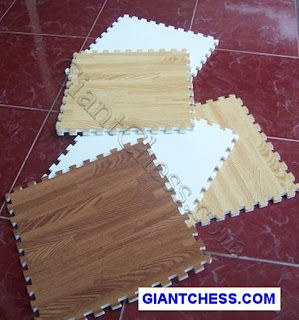 Wooden Color Chess is our attractive product. It adopts the same size and shape as the regular chess set, but it has various colors: black, red, green, blue, pink, yellow, etcetera. The chess board is also beautifully colored in dark and light brown. 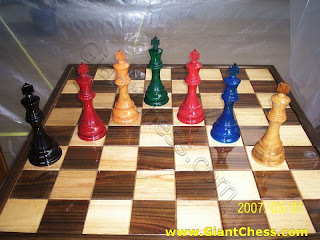 You may also order your favorite colors to your custom-made chess to increase your excitement during the game. We recommend this chess set for children and beginner due to it lovely colors. 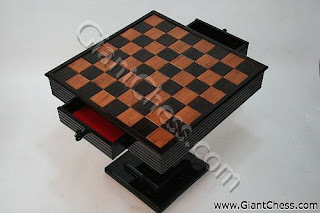 In addition, wooden color chess is also a perfect choice for decoration. Label: giant chess of 72"